I always bake my friends Jo and Teppo a Christmas cake each year but last year they adopted a vegan diet so my challenge was to find a good vegan Christmas cake recipe so that they could still enjoy a festive treat. I came across this blog post by The Hungry Veggie and the recipe had many positive comments so I used this as the basis of my cake and tweaked the recipe to try and make it as similar in taste to my traditional Christmas cake. It must be good as they requested another this year, so now I have their seal of approval here is the recipe. 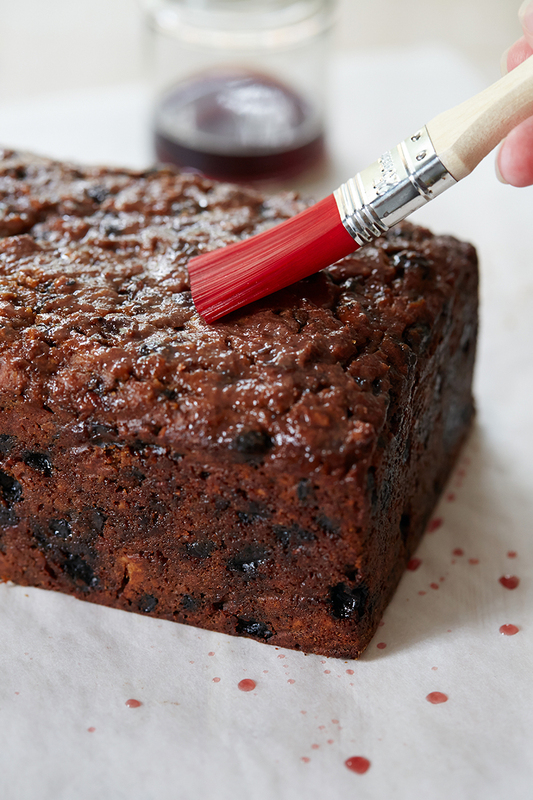 As with my standard christmas cake recipe, soak the fruit for at least a day before you start baking the cake. Weigh out the sultanas, raisins, currants, dates, peel and cherries into a bowl or food storage box and douse with the brandy, stirring to ensure the fruit is evenly coated. Set aside overnight or for up to a week, stirring daily. Stir in the flaked almonds, ground almonds, sugar, orange zest, treacle and brandy soaked fruit, mixing well to combine. Warm half the soya milk in a small pot and add the vinegar. Dissolve the bicarbonate of soda in the rest of the soya milk, then add this to the milk and vinegar mix over the bowl of flour and fruit as it will bubble up when the two lots of milk meet. Stir well to combine. Spoon mix into greased tin and smooth the top and bake for 2-3 hours, until a skewer/cocktail stick comes out clean. Leave cake in tin to cool, then turn out and peel off greaseproof and prick the cake with a cocktail stick and feed with some more of the brandy. Wrap cake in greaseproof and store in a tin and feed with more brandy at weekly intervals until ready to ice and decorate. Will keep for 6-8 weeks. I’m told its very good! Looks wonderful! Thanks Emma … You are a Christmas good fairy. No probs! Glad you liked it last year!